Marcelo Radulovich - "(case of the missing) THUMB"
Marcelo Radulovich first came to my attention playing guitar, bass, and electronics with the Trummerflora collective ("No Stars Please" CD reviewed in AI #17). The multi-talented Radulovich is as much a sound and visual artist as he is a musician, being involved in graphic arts and has done art and sound for video productions. 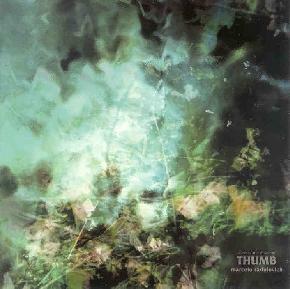 On (case of the missing) THUMB, it is sound and atmosphere that Radulovich explores. Combing mostly ambient music with samples ("field recordings") recorded in such far flung locations as San Diego, Mexico, Big Sur, Hong Kong, and Santiago Chile, he paints an aural landscape that takes the listener on a journey teeming with atmosphere and imagery. The CD is broken up into six tracks though the 44 minutes of the disc are meant to be played and experienced as a whole. While the music mostly communicates surreal but pastoral terrains and quiet corners of space, the samples typically include the sounds of the city, voices of crowds, chirping birds, and other miscellaneous sounds. At one point we even hear the Popeye The Sailor Man theme played like a childrens song. In same ways I'm reminded of a more ambient version of the early Residents. The album does have its harsher moments of brain-piercing sounds, but these are combined with ambient drones and more crowd and unidentified mechanical noises making for a strangely intriguing synthesis of electronics and real world samples. Marcelo has lots of music from his solo and other projects available online at Mp3.com and Ampcast.com (Check out the links at his web site). I listened to several of these and found a varied selection from ambient music similar to THUMB, loungy Dub-like acid jazz, creatively constructed noise and sample collages, and more. Highly recommended to electronic music fans and those who appreciate the creative possibilities of combining real world field recordings with music. For more information you can visit the Marcelo Radulovich web site at: http://www.marceloradulovich.com/. Hear the entire album online at the Zu Casa site at: http://www.zucasa.com/. (case of the missing) THUMB is distributed by Accretions. You can visit their web site at: http://www.accretions.com. Contact via snail mail c/o Accretions; PO Box 81973; San Diego, CA 92138.